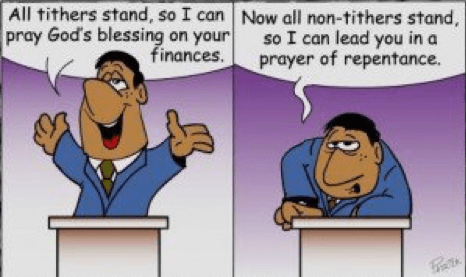 TITHE: WHAT IT REALLY IS. There is a distinct difference between tithing vs giving, and it all comes down to our motive. Let’s take a look at some of the most popular passages of scripture that are often misused to get church attendees to give money. Cain and Abel were the first record in the entire Bible of someone bringing an offering to God. Remember this was long before the Law and the 10 Commandments were ever introduced, and they gave God an offering out of free will. There was no stipulation that demanded they should give anything to God or to the church, because the church didn’t even exist yet. Because so many ministries these days are facing financial difficulties, they often “encourage”�their members to “give” generously to the work of the Lord. Unfortunately most of the time the Bible verses used and the motives given are Law-based. Note the following saying: If it’s God’s will, it’s God’s bill. If He leads He feeds. If a ministry were really commissioned by God and the people established in Grace, the leadership would never have to preach on tithing because the members would automatically give out of a motive of love. They would feel they are actually contributing towards something significant and not feel they HAVE to give just to help their ministry’s struggling cause. When God really commissions a ministry He always provides for that ministry and its people supernaturally. God equips the called. Teaching people to tithe out of Malachi 3 is Old Covenant Law! Remember that the entire Bible was written FOR us, but not the entire Bible was written directly TO us. This section of the prophetic book of Malachi was written specifically to the nation of Israel who was still living under the Old Covenant Laws and had at the time turned away from God. The following is a short extract from Matthew Henry’s Concise Commentary on the Book of Malachi:Malachi was the last of the Old Testament prophets, and is supposed to have prophesied B.C. 420. He reproves the priests and the people for the evil practices into which they had fallen, and invites them to repentance and reformation, with promises of the blessings to be bestowed at the coming of the Messiah. In fact God never has to do a single thing again to prove Himself faithful, because He has already given his most treasured gift: His own Son! And the most ironic thing is this: When people are recommended to “test God’s faithfulness, they are normally also given the bank account details or very conveniently told where they can deposit this money with which they intend to “test” God. In Part 2 of this series we will explore the principle of “giving” in the New Covenant, and how vastly it differs from “tithing” in several different aspects. Posted byExclusive March 24, 2019 Posted inUncategorizedLeave a comment on TITHE: WHAT IT REALLY IS.